Oil rigs and remote pipeline locations are some of the most dangerous and challenging work environments anywhere. When looking for electronics to support these environments, devices must stand up to three key requirements: provide advanced system monitoring even in the most challenging conditions, accurately identify and track assets and communicate data from remote sites, and withstand the highest scrutiny of certification and inspection. Because the conditions are risky for both personnel and equipment, reliable and accurate monitoring is crucial to maintaining safe operations. Computers at these working locations must also maintain detailed data on, for example, petroleum exploration and transportation. To meet the safety qualification, Winmate offers ATEX and Class 1 Division 2 (C1D2) certified solutions for maintaining safe operations and collecting detailed, sensitive data in remote rig and pipeline locations. 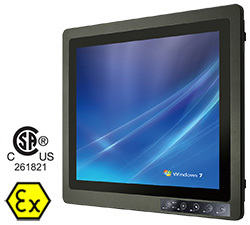 Winmate designed its line of stainless panel PCs in response to the need for panel PC equipment that could withstand environments where flammable substances may be present. With this need in mind, Winmate’s developed the 19-inch R19IHAT-66EX, both certified for use in hazardous environments where explosive gases may be present – specifically in Class 1 Division 2, Groups A-D (i.e. acetylene, hydrogen, ethylene, and propane) classified areas. For European customers, the device meets requirements for ATEX Gas zone 2 classified areas.